This information is for psychiatric trainees already working and training in the East of England. Many members of the University Department are keen to supervise psychiatric trainees in research projects. There are a number of existing projects running in the department, which trainees can join in with, or, there is also the possibility of a trainee starting a project themselves under supervision. 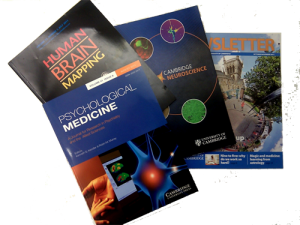 Trainees are very welcome to browse the university department website, or the Cambridge neuroscience website www.neuroscience.cam.ac.uk, and to contact individual members of the department to discuss options (so don’t feel limited to only the options below). Prof Paul Fletcher is the research tutor for psychiatric trainees on the East of England training scheme, who can provide advice. His email is pcf22@cam.ac.uk. He will be delighted to meet with you and discuss any research plans that you may have. Listed below are various projects which department members have thought are potentially suitable for trainees, but this list is by no means exhaustive. If you would like a project to be added, please contact the webmaster. The University of Cambridge Intellectual and Developmental Disabilities Research Group is an interdisciplinary research that has various research themes. These include neuropsychiatric projects led by Howard Ring, sociological studies led by Marcus Redley, studies investigating the clinical/legal interface in learning disabilities led by Isabel Clare, neurobiological investigations led by Shahid Zaman, and syndrome-based studies led by Tony Holland. Details of research and recent publications can be found on our website. SpRs interested in research in learning disability should contact Tony Holland ajh1008@cam.ac.uk or if they have a specific project in mind, they can contact anyone of the above directly. Autism Research Centre: The ARC has 6 main research programs focused on autism spectrum conditions (ASC). These are: (a) Perception and Cognition; (b) Neuroscience; (c) Genetics and Proteomics; (d) Hormones; (e) Screening and Diagnosis; and (f) Intervention. The research group comprises 20-30 staff from a range of scientific disciplines. SpRs looking for research experience are welcome to contact Professor Simon Baron-Cohen to explore collaborating on an existing project or setting up a new one. Dr Ersche conducts several research studies in drug-dependent individuals; Drug Addiction Research group. She welcomes trainees who have a genuine interest in drug addiction research. Trainees’ involvement would be dependent on their interests and time constraints. Contact Dr Ersche. The brain basis for psychotic symptoms (see here). The SEPEA study is a major epidemiological study of first episode psychosis in East Anglia. The study seeks to understand more about the underlying social aetiology of psychotic disorders in rural communities. Dr Kirkbride is currently seeking psychiatric trainees interested in developing their research skills, in particular regard to undertaking research-based diagnoses using a computerised diagnostic tool known as OPCRIT. Psychiatric trainees will be provided full training to use this system before using it to make research-based diagnoses from participants taking part in the study. For more details, please contact James. Research in chronic and persistent schizophrenia (www.psychiatry.cam.ac.uk/f20), mostly with patients recruited at the CPFT clozapine clinic. Different studies, including clinical and pre-clinical research projects. We can accommodate a few trainees, as we are doing already, so please feel free to express your interest (email to ef280@cam.ac.uk) and we will discuss opportunities. Dr Muller runs the Adult ADHD Clinic at Addenbrooke’s hospital, where Dr Dowson started to collect a cohort of patients in 2000. We have ongoing clinical, psychopharmacological, neuropsychological and neuroimaging research projects. We can accommodate 2-3 psychiatrists available for 1 day per week. You would be responsible for psychiatric assessments using standardised interviews and rating scales and/or medical cover for neuroimaging and pharmacological studies. The lead consultant will provide clinical supervision and research training. Please contact Dr Muller (um207@cam.ac.uk) for further details. 1. Genomics/Biomarkers in First Episode Psychosis with Bahn Group, Institute of Biotechnology, University of Cambridge. Ongoing in Bedford and Luton 2. Comparison of care of first episode psychosis patients between Early intervention service in Luton with community mental health teams in Bedford. 3. Acupuncture in Psychiatry 4. Safety & efficacy of treatment in people with prodromal signs of psychosis. In Collaboration with Institute of Psychiatry (Professor Phil McGuire). 5 Study of Psychotic Prodromes in Slovenia.